Grilled meat on a stick. What could be better? 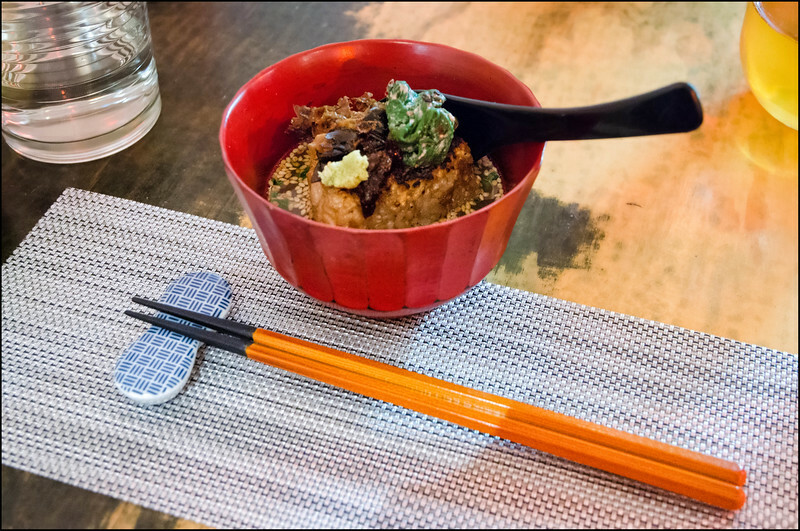 Two years ago we were cruising around the bars and back streets of sleepy Ishigaki when it hit me…Hobart would be the perfect market for the incredibly tasty morsels of food served at Japanese izakayas! Crisp sunny days, cold winter nights…what better accompaniment than a couple of skewers of char grilled chicken skin, a bowl of edamame and a frosty beer?! It seemed like such a great idea, yet no one had taken the plunge. Over the last few years there has been a distinct rise in the number of Japanese dining options in cosmopolitan(ish) Hobart. Orizuru, Kawasemi, Midori, Miyabi, RIN…I can’t explain why, but it’s a fantastic sign of the diversification currently underway in the Hobart food scene. With this in mind, it was with palpable excitement that I first heard about the new venture being undertaken in the Elizabeth Street building that previously housed The Schwartz Sandwiches. Oddly named ‘Three Japanese’, no one was quite sure exactly what style of Japanese food they would be serving up. Yakitori? Tepanyaki? Shabu shabu? Yakiniku? All we could do was wait and see! The other detail that was also getting me a tad excited was the fact that they seemed to have strong links to the ethos crew (previous owners of The Schwartz Sandwiches). If they could do for Japanese cuisine what ethos has done for Modern Australian then this was going to be one exciting little venue! Right from the start we knew we were going to indulge in the 12 course tasting menu for $60pp. A la carte was an option, and while I’m sure it would have been good (we could see how great some of the dishes looked as they were marched past our table! ), we wanted to get the complete Japanese experience. We were so keen to see what these guys could deliver! 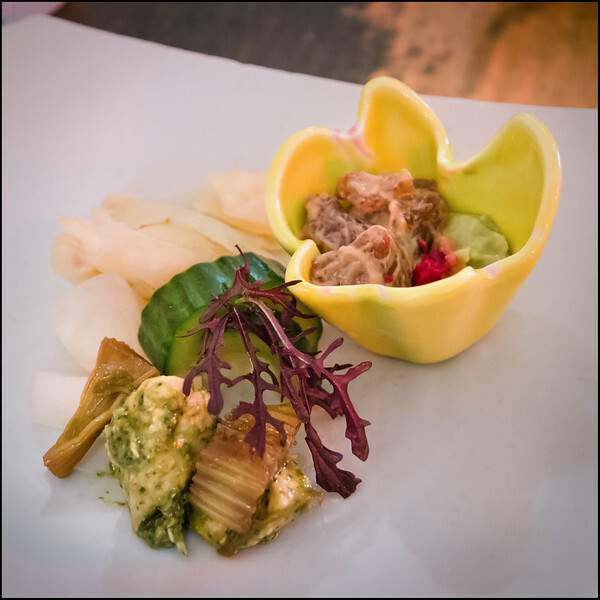 First course was an amuse-bouche, consisting of homemade pickles 3 ways, striped trumpeter marinated overnight in a soy base sauce, and an avocado and beetroot tofu dip. 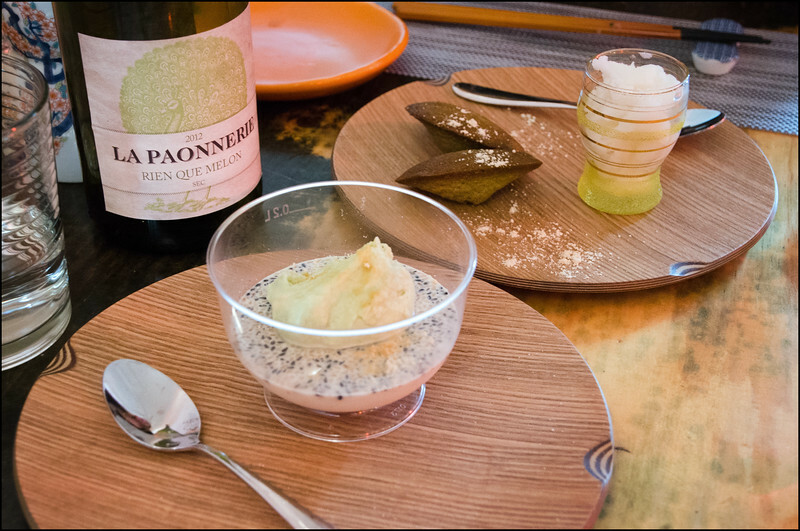 The amuse is a dish that changes quite regularly, so be prepared to be offered something different to what we experienced. A great way to start the meal. The homemade pickles had a perky tang and tartness to them that lifted the palate and complemented the soft textures of the trumpeter extremely well. Surprisingly, the tiny sprig of purple seaweed also packed a lot of flavour! Even better though was the 30mL cup of sake that was served with the amuse. Hailing from the Saga prefecture in Japan on the island of Kyushu, the ‘Nabeshima’ Junmai Daiginjo sake was a real eye opener. I’m not a sake connoisseur by any means, but even I could tell the quality of this delicious drop…light on the tongue, fruity, and yet not overly sweet. I never thought I would say this about a sake, but it was so good that I’m very keen to try and track down a bottle! Next up was a chawanmushi, but not just any old chawanmushi! Instead of the normal chicken egg, this one used duck egg, and instead of taking the easy option with an off-the-shelf fish stock, the crew at Three Japanese had created their own stock (dashi in Japanese) from scratch, comprising kombu (edible kelp) and katsuobushi (bonito flakes). As with so many Japanese dishes, the presentation was simple, yet the flavours were so full of depth. Such an odd texture for a main course, yet I was smiling! The savoury flavours of the dashi and the sauce made from yuzu, chilli paste and kuzu (a variant on a yuzukosho sauce perhaps?) were just incredible. It was an early call, but the correct one…this was the dish of the evening for me! 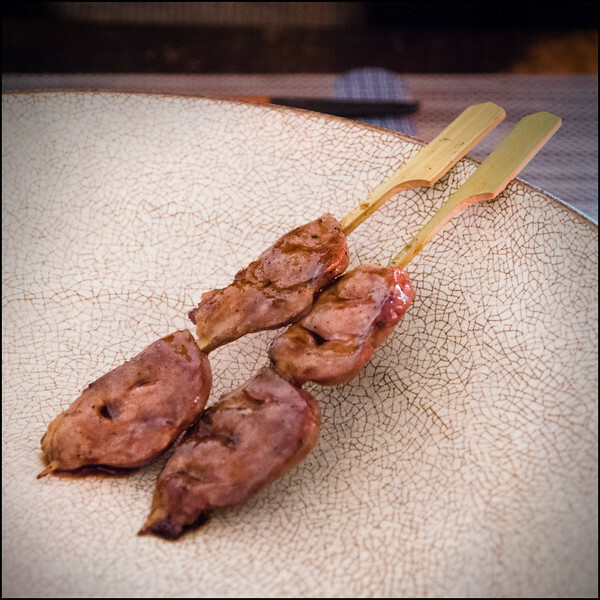 Next up was what we were really looking forward to, charcoal meat on a stick! Surprisingly, our choice of favourite skewer was both unanimous and bizarre. By far and away the best of these was the chicken hearts! Other varieties that may be offered to you include chicken tail, chicken cartilage, beef skirt, tofu and cheese! 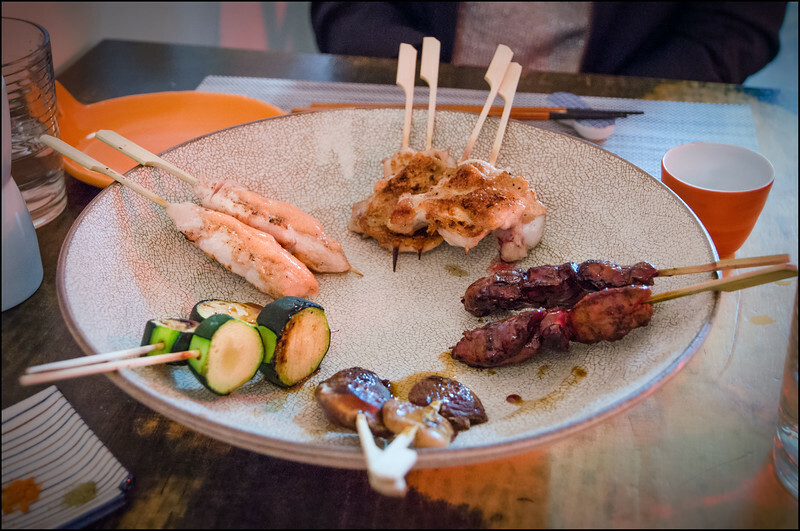 There were also some great dipping spices provided with the yakitori, including one that literally had to be carried from Japan to Australia by hand as it’s impossible to source online. So worth it though, I’ve never tried anything like it! Chicken heart!! Who knew it could taste so good?! The only suggestion I would make regarding the yakitori is regarding the way in which they were presented to us. While the large bowl was gorgeous, I didn’t think it really showed off the food to its best advantage. My recommendation would be to look at using a long, flat, rectangular plate with the yakitori lined up alongside each other, perhaps even top-to-tail for a his ‘n hers experience! Our next dish was a solid little number. Known as yakionigiri, this was a large triangular grilled rice ‘ball’ in a kelp and bonito broth, topped with marinated spinach and sesame, together with wasabi in chicken broth (mmm…!). A lot of ingredients, a number of which unfortunately went hiding, but nonetheless very tasty and of a generous size. To finish off the evening we were served a couple of very nice desserts. I’m a sucker for a sorbet and the yuzu citrus sorbet in this instance didn’t disappoint. Clean fresh fruity flavour, slightly acidic undertone, and feather light on the tongue…my ultimate dessert and the perfect palate cleanser! The accompanying green tea madelaine was also quite tasty, although it’s a shame they weren’t fresh out of the oven. 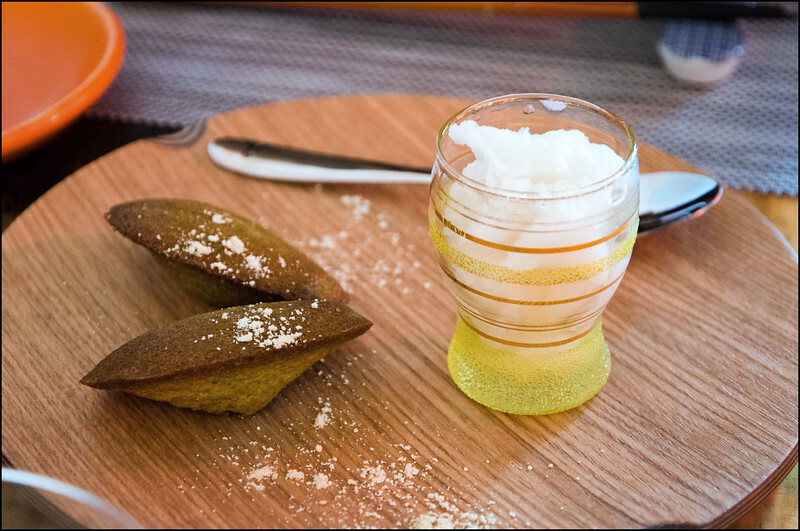 The sesame pudding with green tea mascarpone cream and roasted soy bean powder was also surprisingly good. While Karen would beg to differ, I say surprising because I’ve never been much of a pudding lover. This awesome little dish was almost enough to convert me though! Velvety smooth with some really rich tea flavours coming through from the cream, and the odd little bit of crunch provided by the numerous sesame seeds scattered across the top. Quite decadent! Our evening at Three Japanese didn’t disappoint! Three old friends with a shared vision and genuine love of authentic Japanese cuisine have created the most wonderful of experiences. This isn’t kitsch, westernised Japanese for the masses (thank goodness!). 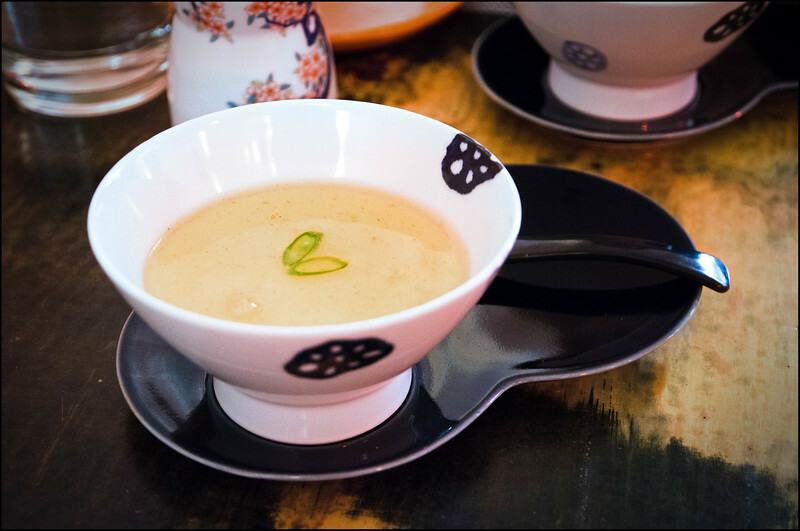 Instead, Hobart foodies now have both the opportunity and privilege of tasting the real flavours of Japan. How many other venues in town can claim to create every single sauce or stock totally from scratch? Where else can you try striped trumpeter sashimi, where the fish has been killed using the traditional and ethically preferable ikejime technique of paralysation? Apparently there is only one fisherman in Hobart with sufficient skill to do it properly and these guys have tracked him down! As I mentioned, there are some aspects of the experience that could be improved, but I’m sure that with a little bit more time and experience under their belts it will come. The service was incredibly friendly, and from that perspective couldn’t be faulted. However the timing of the attentiveness was just a little bit off kilter, resulting in a reasonable wait before we were asked to place a drinks order. At another point in the meal one of us hadn’t quite finished their plate yet the clearing up commenced anyway. I’d also suggest that some interior decoration should be considered, and particularly on the walls. It’s all just a tad impersonal at the moment, which is totally at odds to the warm and relaxed nature of the team behind Three Japanese. But again, it’s only early days! The wine list was quite interesting, with a very handy collection of wines from both Tasmania and France, in addition to a good selection of sakes as well. Unfortunately the wine we were keen on was not in stock, but the suggested replacement proved to be inspired! If you couldn’t already tell, I’m really excited about the experience that Three Japanese is offering to Tasmanians. It’s great value, tastes amazing, and is supporting local producers across the State. I’m already looking forward to a return visit! For more information, drop by their Facebook page here. They do have a website here, but it’s pretty bare bones. mmmmm i discovered chicken hearts in Napier last year.. surprisingly wonderful.. looking forward to this. There’s a town I haven’t thought of for a while! Looks delicious. Izakayas are great adventures, in that they present amazing food but can prove dangerous through the bill you receive at the end of the night. I know what you mean Duke! Considering the interesting dishes we were served, and the incredible sake, I was quite comfortable paying $60. I could easily see how someone could feel it was too much though. Sounds amazing- cannot wait to try this place out!